It is not wrong to say that on-demand apps are on high demand. These apps have helped many businesses to improve their business. It is very convenient for people to get a service or a product. These apps have made life easy for all of us. Everyone is busy nowadays. Nobody enjoys going out to buy their grocery. People spend a long time building their careers. There is hardly time to do household chores. Whatever time they get at home, they want to spend with family. Washing is a task that takes up a lot of time. People don’t want to do it at home when so many laundries are nearby. The laundry app made it even easier to get clothes washed by the laundry. What Is An On-Demand Laundry App? Why Have An On-Demand App For Laundry? 1. What Is An On-Demand Laundry App? Before we see how to build an on-demand laundry app or what features it should, let us know what an on-demand app for laundry is. People are using many apps for buying things or calling a cab. It is the easiest and fastest way to get a service from wherever they are. Mobile App Development for laundry will have the facility for people to place laundry orders with you. You will arrange the clothes to be picked up and delivered to the laundry shop. You will also pick up once they have finished the laundry. You should get as many laundry shops and customers to download the app. 2. Why Have An On-Demand App For Laundry? Downloading the app and registering on it can get laundry shops more business. Their customer reach will be much more extensive. People in the area will know about your services. It is much more economical than advertising. Laundry shops will be more than willing to pay a commission to you because of the extra business they are getting. You person will do the pick-up and delivery. With this app, the customers won’t have to find the laundry shops. As the customers can book through the app, they can fix the timing for picking up and delivering the clothes. Through the app, your customers can find the different services that different laundry shops offer. If they have any specialties to provide, it is easy for customers to know about it. As you upload the prices in the app, they will know exactly how much to pay. There are many advantages to the app. The Top Mobile Application Development Companies in India give prime importance to the app model. The same applies to the case laundry app where understanding the model is vital for your success. There are three entities involved in the process. There is the app owner or admin. The laundry shop owner is another entity. Then there are the clients. All the three will have their pages in the app. The client page will enable the clients to book the service. They can create a profile and log in using email id and mobile number. They should be able to find laundry shops near them. Then there should be details of all the services offered by these cleaners. The client should be able to choose the services. The interface should be smooth and straightforward. Once the customers select the services, they can choose the time and date for picking up the clothes. You should mention the prices so that they know how much they have to pay. There must be a provision for finding customer location. It will help in picking up the clothes quickly. You must also ensure the customers can choose special services like stain removing, on the app. The laundry shop will have a page for their details. They can sign up for the app and provide their services. There will be a facility for them to confirm the booking by customers. They can also post all the services offered by them on their page. The cleaners can display any special offers by the cleaners. It should help them track orders. They must be able to enter the date of delivery. Order history is another important information the laundry shops will need. The third page is yours. As an admin, you should find where the customer wants to clean their clothes. Your delivery person will pick up the clothes and deliver at the laundry shop. You will coordinate between the customer and the laundry shop. You will be the one who handles all the database. You should be able to know all the details about the orders placed and delivered. You will handle any complaints. Like the food delivery services, it is better to have your people doing the picking up and delivery so that there is better coordination. The person who picks up the delivery will be able to enter the time he picked up the clothes and other details of the order. Once he or she has entered the details, the changes should reflect on all the other pages. It will help in tracking the order accurately. There are three sides involved in the business. The app should allow all the three entities to be able to fill in all details. All of them should be able to track the order. Let us see the key features that are necessary. The page should be simple. Customers should be able to log in with their name, mobile number, and email id. The app should find its location. It should be simple and easy for customers. The laundry shop will have a page to register themselves for the service. They will enter their details with address and sign up on the app. Once they recorded their details will appear when the customer searches for a nearby laundry shop. The customers must be able to see all the services each laundry shop offers. They should include all the details of the services. The customers must be able to see the price for each service. The cleaners should upload the details of their services. You should mention the price for each of the service. There should also be a mention of special services if they are using any particular care methods for the garments that can also be specified. The laundry shop should be able to manage the services page efficiently. There must be a facility for them to make special offers. Cleaners should be able to enter any discounts that they offer for any period or any types of service. Customers must be able to know the cleaners that are near their residence. Location tracking will help in finding this. The laundry shop profile must have their full address and phone numbers. There should be a provision for customers to enter their reviews. It will help new customers in selecting the right laundry shop for their clothes. It is an essential page. You should always mention all the services and their price clearly. Customer must be able to choose special services for a particular item of clothing. They may require a stain removal service for one of the garments. The app should have a facility for customers to upload photos of garments to show the stain. It will be easy for the laundry shop to assess and quote a price. It will also be easy for the cleaners to know which garment has a stain. Different types of cloths have different washing instructions. This selection must be available on order booking page. It will help customers to select the right kind of washing for their clothes. Once the customers enter all the items and services, they should get confirmation on the total amount they must pay. It will help them know in advance how much they must pay for the service. The app should help the customers schedule the pick-up. Customer can pick the date and time as per their convenience. It will ensure that they will be available when the delivery person arrives for pick-up. Many customers are in the habit of selecting a day of the week for sending their clothes to the cleaners. There should be a built-in facility for customers to fix this. The app should be able to carry a reminder to the customer about the date and time so that they keep the clothes ready. If the reminder facility can send a message to the cleaners, they can also plan the pick-up and cleaning services in a better manner. Once the customer places an order, it is the laundry shop’s responsibility to establish the order. They should check the order and ensure they can service the request correctly. If there is any difficulty in offering the service, they can cancel the order from their side. If the cleaners can service the order, then they should confirm it. Once the customers receive the confirmation, they can make the payment. Once they pay, it is your duty as admin to arrange for the pick-up of the clothes. While confirming the order, the laundry shop should mention when the clothes will be ready. It will help you to schedule the delivery to customers. The app should allow customers to pay using different methods. There should be an option to use credit cards, debit cards, digital payment, and e-wallet. It will help customers to pay quickly. Many customers abort their purchases due to the non-availability of choice payment modes. Once customer confirms the order, you should schedule the pick-up with your delivery persons. You should then inform the customer by message confirming the pick-up. You should notify the details of the person who will arrive for the pick-up. After the pick-up, the person should enter this on his page of the app. The confirmation message should reach the client, the laundry shop and you. After completion of the work by the laundry shop your person should deliver the same to the customer. It is better to inform the delivery schedule to the customer so that they can be available to receive the clothes. All smartphones have a GPS facility now. The app should allow the customer to track the delivery person. As you can montior the arrival of the cab through Uber, you should make the facility for the customer to track the delivery. The customer must also know the progress of the order. The laundry shop must update the progress after each stage. It will help make the customer feel that the order is in the progress and soon it will be delivered to them. There should be a way to confirm delivery. The customer page should have the means to assure delivery through the app. As soon as the delivery person complete the delivery, he/she should request the customers to confirm the delivery. Both the laundry shop and you should receive this confirmation. It is one of the main advantages of a mobile app. You can inform many things through the push notification. You should include it in the app. It is an essential tool for both you and the laundry shop. The push notification will be useful to send customers information about discounts and offers from laundry shops. You can also send them information about pick-up and delivery time. If you want to mention any new addition to your services, you can inform the customers through this notification. Customers should be able to rate and review the service and the laundry shop. They should evaluate your function about pick-up, delivery and keeping up with the schedule. They should be able to rate the services of the laundry shop which will increase business for them. It will, in turn, improve your commission. The laundry shop also should be able to read the reviews. There should be a facility to share the reviews to the various social media sites. The laundry shop can share good reviews on their Facebook, Instagram or Twitter pages. The app should allow the laundry service provider to track their orders. It will help them identify their loyal customers and offer them special offers or discounts. It will also tell them how their business is progressing in each area of operation. They can also see which of their services is receiving more orders. The customers should also be able to rack history. They should be able to know who has given them faster service. They should know who they have given the maximum orders to. As the admin, the app will update you of all completed and delivered orders. You will know how many orders customers have placed with each laundry shop. You will know the total amount received by them and also the commission due to you. Any complaints from the customers will reach you. You can take necessary action by coordinating with the cleaners. If there are delivery or pick-up issues, you can sort it out with your fleet drivers. The main features that the app should have can be summarized as below. Facility for laundry shops to update profile, pictures, and logo. The laundry shop must display all the services. Customers can select the laundry which they want. Location tracking facility to show the nearest laundry shop. Customers can select services. They can ask for special services like stain removal. Customer will have the facility to upload a photo of a garment to show stains or other problems. Customers can know the amount and confirm the order. They can schedule the pick-up. Reminder facility for reminding customers about pick-up. Laundry shop can confirm or reject the order. Once confirmed payment could be made using different payment methods. App owner/admin will arrange pick-up and delivery. Real-time tracking of order is possible. Push notification can remind customers about pick-up and delivery. Customers can review and rate the laundry shop or service provider. They can share reviews over social media. Tracking of order history is possible by both customer and cleaners. There are two ways of using this app. Either you can have your laundry shops and use the app to attract customers. For start-ups, this will be a significant investment. It is also not easy to make it a success very fast. Customers will have their own trusted cleaners. The other way is to launch the app and get laundry shops to download it. They can use the app to get a more comprehensive customer reach. It will help their business. You can arrange for the fleet to pick-up and deliver the clothes. The app will earn you delivery charges and commission on sales. The second model is better for new businesses. The investment is low. The customers are already existing. You make their experience better with the app. The laundry shops get better business using the app. As the admin and app owner, you can opt to maintain the fleet. It is a good way of revenue. You can use the services of private car owners to attach themselves to your company and do the pick-up and delivery. You can earn the delivery charges and pay them their transport charges. 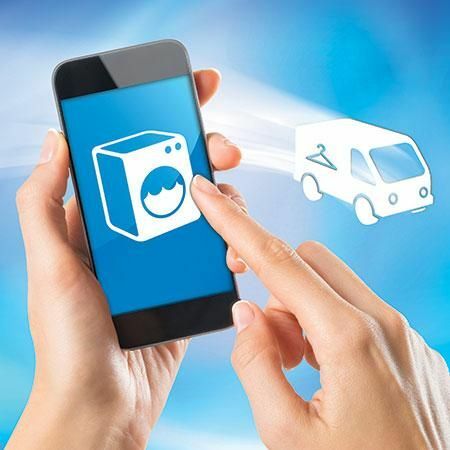 It will help to streamline the pick-up and delivery. You can also earn extra money this way. You can get even small laundry shops who don’t have their delivery vehicles, to join your laundry services. Using cloud computing can make your app function better. Storing data on the cloud will ensure they are safe. You can deploy your app on the cloud which will make it easy to access and more economical. You can use GPS technology for reaching different locations on time. It will also tell your customers the correct time of pick-up or delivery. They can track the movement on a real-time basis. It helps in finding laundry shops. You can use different analytics tools to be more competitive in the market. It will let you know how your competitors are functioning. You will know about the current prices in the market. It will help you guide your business in the correct path. People have no time to do the laundry by themselves. People like to use the time for other activities. They hardly get time to spend time with their family and friends. Getting a laundry service to do it, gives them a lot of time for themselves. It opens up an excellent opportunity for app development companies to create an on-demand laundry app. It will allow customers to choose their favorite laundry services from their neighborhood. With an app, they can get the necessary facilities. They can get the clothes to be picked up from their homes and delivered after washing. Building a laundry service app is an excellent way to earn money. Start-ups can make this a business opportunity to use technology to earn money. The app should provide all the necessary services to both customers and laundry shops. An easy-to-use app can get you good business. If you want to develop an on-demand laundry app for your business, then Avail Our Services. Our developers will guide you on this subject.